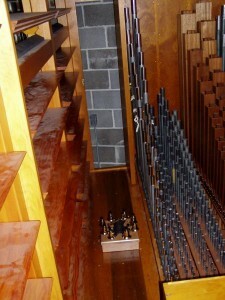 This organ is unique in American organbuilding. It is the magnum opus of Harry Kriisa, an Estonian-born organbuilder whose family firm in Taalin (founded in the 19th century) still exists. At the end of World War II, Mr. Kriisa’s immigration to the United States was sponsored by the congregation of First Lutheran Church. Mr. Kriisa worked as an organbuilder in central Illinois for the remainder of his life. 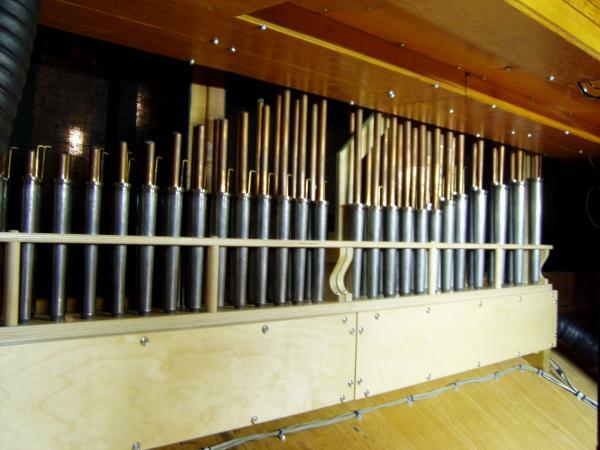 When the church built a new sanctuary in 1965, Mr. Kriisa constructed his largest instrument for the church, which exists today. 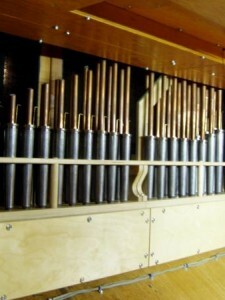 Relocation of the Choir 8′ Krummhorn to a new unit windchest constructed in our factory, so that it is available in the Positiv at 8′ pitch and in the Pedal at 4′ pitch. Installation of an 8′ Clarinet in the Choir in place of the Krummhorn. Revoicing of the existing pipes 1-12 of the Pedal 16′ Trombone and construction of a new 61-note 8′ Trumpet to replace the remainder of this rank. This stop is available at 8′ pitch in the Great and at 16′, 8′ & 4′ in the Pedal. First Evangelical Lutheran Church, Decatur IL – Harry Kriisa, Decatur, IL, 1970.